After my previous post I decided to play with SDL and try to setup code::blocks with both OpenGL and SDL. Both should work with code generated by the Template. I have to stop here. If you need more information you can find several tutorials about SDL and OpenGL. 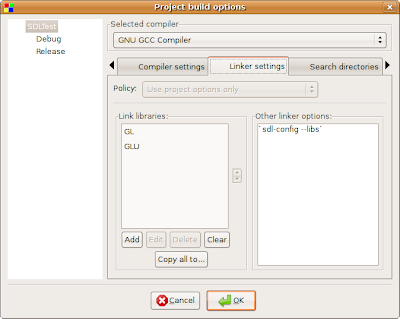 thank you, i was getting a hard time trying to link correctly to sdl + opengl in CodeBlocks for linux. I success to did it in Windows but now I can port my project to linux too.